I'm going to be taking these books one chapter at a time, but admittedly this is still a work in progress, so the format of this content is still to be determined. But I'm picturing a mix of review, analysis, and random tangents about my own interaction with the material. So I hope that you're up for some random left turns. 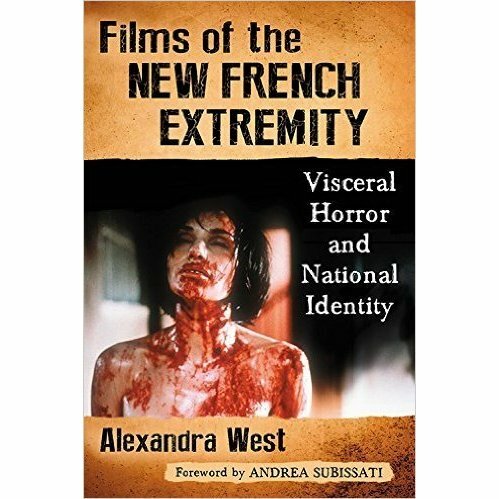 To kick things off, I'm finally getting to a book that's been on my to-read list since it came out in 2016 called Films of the New French Extremity: Visceral Horror and National Identity. Those who know me have likely heard me gush about author Alexandra West's podcast, Faculty of Horror, where West and co-host Andrea Subissati layer historical and sociological context into their analysis of horror films in a way that completely changed the way I looked at the genre. I was able to connect to my favorite films in new ways that allowed me to fall in love with them all over again. With Films of the New French Extremity, West takes the analytical eye from her podcast to delve into an era of films from the early 2000s known for their brutal, unflinching depictions of violence. Having myself seen some of the more well-known titles of this sub-genre, including Frontier(s), Inside, Martyrs, High Tension, and Trouble Every Day, I find they can be too unrelenting even for a lifelong horror fan like me. In her introduction, however, West explains that these are "not violent films, but films about violence." Filmmakers of the New French Extremity seek to supplant France's vision of itself as an idyllic cultural cornerstone by confronting audiences with the nation's history of xenophobia, police brutality, and rioting. She notes that we Americans had a similar movement in the 1970s, when movies like Last House on the Left and Thee Texas Chainsaw Massacre forced us to take a good long look at our own flaws in ways that made people equally uncomfortable (thank goodness we took care of those, right?). So as I dig into West's take on this harsh but meaningful sub-genre, I look forward to finding those layers I probably missed while being too busy biting my knuckles in abject horror. Next week, I'll be covering West's opening chapter, where she'll give us a primer on the history of France (spoiler alert: people fought a lot) to set the foundations for the violence that permeates the New French Extremity.